Description: A system, apparatus and method, consisting of firmware, software, oscillating motors, a garment, and peripherals that permit users to interact over the Internet or wireless communications network with games or each other users whereby the sensation of touch is felt by the garment user. 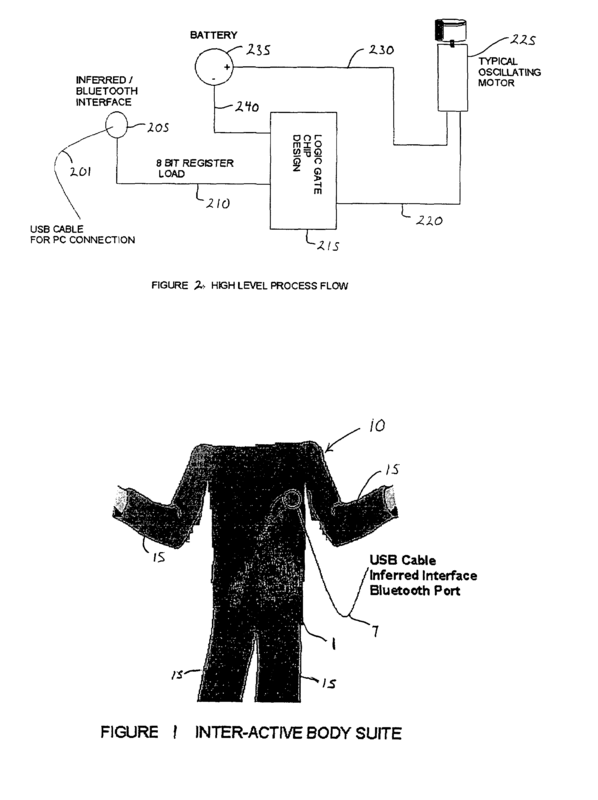 The invention consists of an interactive body suit that covers the torso. Peripheral gloves, socks, and adult entertainment attachments for men and women attach to the interactive body suit in appropriate locations. Small oscillating motors embedded in the garment and the peripherals produce a vibrating touch sensation when activated. Each motor has a logic address on the suit or peripheral device that correlates to a logical point on a computer graphic representing the user. Contact with the graphic will generate a command signal that activates a motor in the corresponding area on the suit. In one application, limb covers with embedded oscillating motors are used to provide medical treatment massage therapy.